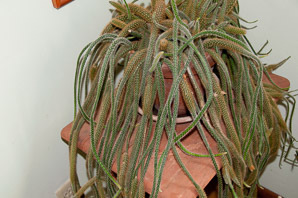 Rat tail cactus, like other members of the genus Disocactus, is an epiphyte—it is found growing on other plants, in this case trees. Flagelliformis means long, thin, and tapering; whip-shaped. Native to dry forests in Mexico, it is quite rare, and not found in the wild in the US. 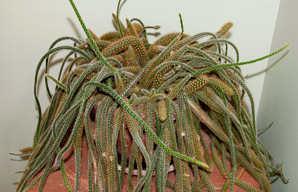 It is a popular and hardy indoor plant. This is one of the first cacti to be introduced into European culture, around 1690. 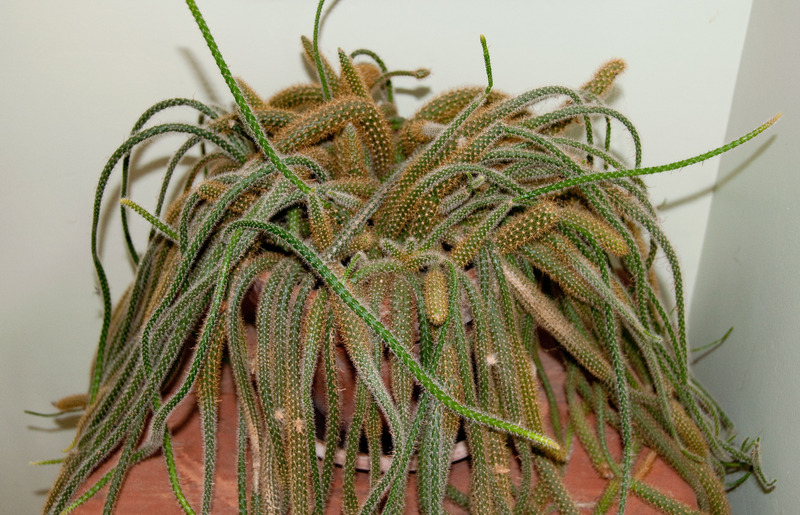 The rat tail cactus shows no gratitude for the collector who chooses to domesticate it. In fact one could easily imagine that the plant harbors an enmity to the point of exhibiting a real malevolence towards it’s benefactor. Should you get too close this becomes clear for the rat tail will not suffer being touched. To do so, even lightly, invites the incredibly small spines to lodge themselves painfully in your skin. To make the experience worse, the diminutive size and whitish color of these spines render them almost impossible to remove. Having had this eye opening experience a few times I recommend that these plants be handled only when wearing leather work gloves. I have read a recommendation that the rat tail cactus be repotted with some frequency however I only did this once and will not do so again. Consider yourself warned! The plus side of these cacti are their beautiful flowers. The “rat tails” can grow quite long and when they bloom it truly makes the effort (and suffering) worthwhile. 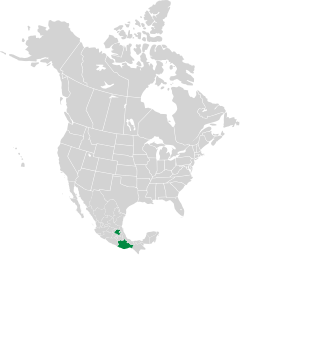 I would also add that irrespective of the rat tail’s dry heritage, the high Mexican forests I believe, they do extremely well in hot humid environs such as southern Louisiana. 1Don't confuse this with the genus Discocactus. 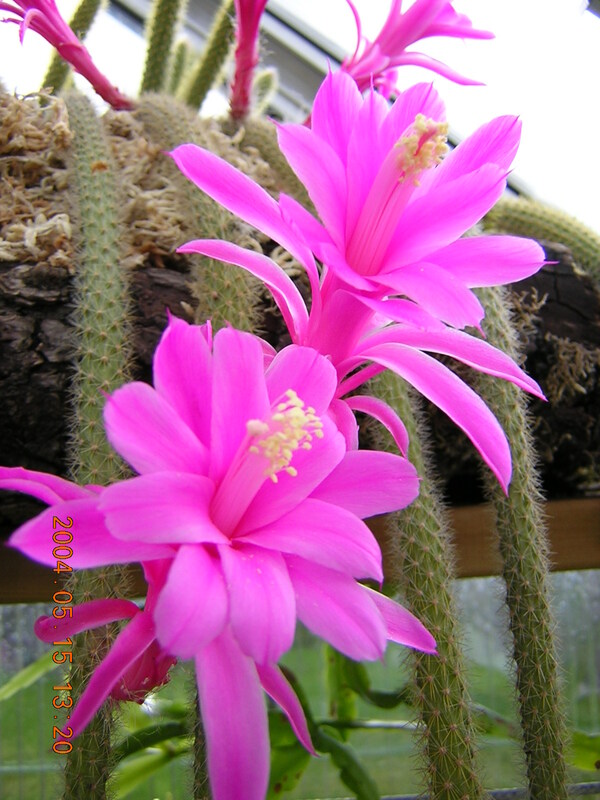 Disocactus flagelliformis description by Thomas H. Kent, last updated 12 Oct 2018.